The V-fit MTT1 Self-Powered Folding Treadmill is one of the brand’s entry-level running machines. It’s made to get just the right amount of cardio exercise every day. It may be one of the cheapest on the market, but since it’s manufactured by a UK brand, I believe that it’s made with high-quality materials. With manual treadmills like this one, you don’t need any to plug to plug into the mains, which means you can exercise whilst saving electricity too – a win-win situation! However, even though it doesn’t cost too much, you surely don’t want to waste your money on something that isn’t functional. Let’s take a closer look at the V-fit MTT1 Self-Powered Folding Treadmill and see if it’s worthy to be a part of your home gym. Just because this treadmill is affordable doesn’t mean it isn’t durable. The V-fit MTT1 Self-Powered Folding Treadmill is made of an epoxy-coated robust tubular frame and has just enough running deck (100 x 30cm). All of V-fit’s products comply with the latest European Safety Standards as well as the demands of Environmental Regulations, which means a high-quality product is guaranteed. It has a 100kg maximum user weight so various users can workout with this running machine. Basic treadmills rarely have pulse sensors included in them, but the V-fit MTT1 Self-Powered Folding Treadmill has them on the handlebars. Even with walking and light jogging, monitoring your heart rate is essential in keeping tracking of the progress you’re making. This treadmill is set at an 8% incline to get a sufficient manual workout with every session. 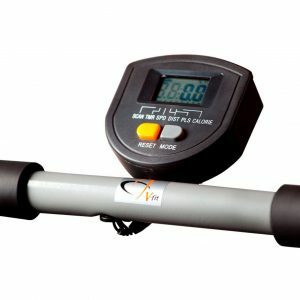 With pulse sensors on a low-priced treadmill, you’re guaranteed to get excellent value for your money. Being a simple running machine, the V-fit MTT1 Self-Powered Folding Treadmill has a small LCD screen that displays your distance, calories burnt, time, speed as well as your heart rate. This monitor requires 2 x AA batteries to work, but other than that, the whole machine will merely need your energy to work correctly. The V-fit MTT1 Self-Powered Folding Treadmill is very compact as it only measures L 125cm x W 63cm x H 136cm when assembled. Even if you have limited space inside your house, you can still build your home gym because of compact fitness machines like this one. Aside from that, this treadmill is also foldable, and it has transportation wheels to make it easier to move around the house. It only weighs 21kg, which may be light for some, but for others, it’s already massive so they might need some help. Since this is a basic manual treadmill, it’s not suitable for running. It best recommended for beginners and those who don’t want to push themselves too hard. The V-fit MTT1 Self-Powered Folding Treadmill also may not be the best option for users taller than 6ft because the running area is too short for their foot stride. Nonetheless, if you’re shorter than 6ft, this treadmill can be a great way to get enough cardio workout on a daily basis. If you have some extra cash to spare you can opt for this basic electric treadmill. 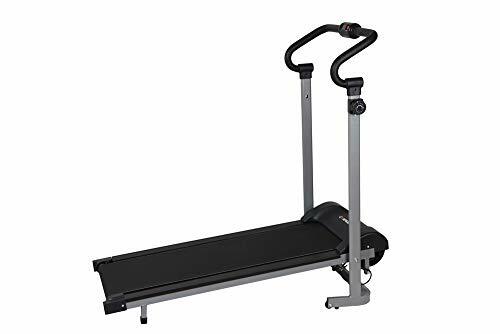 The Hi-Performance Electric Treadmill Review is powered by a 1.0HP motor with a top speed of 10 km/h, so you don’t have to drag the belt by yourself. It has three programme modes to start with, which are great for beginners and it can hold users up to a maximum weight of 100kg. 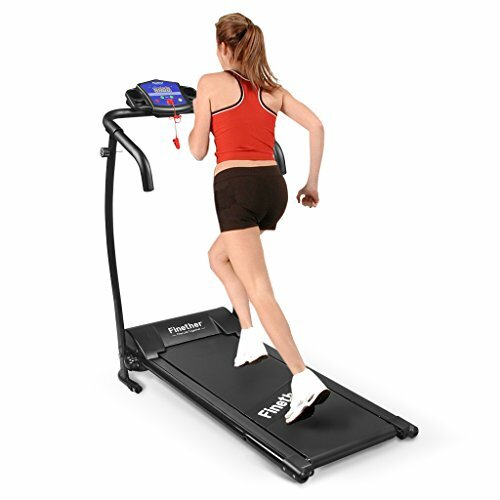 This model has a wider running surface than the V-fit MTT1 Self-Powered Folding Treadmill that measures 101cm x 34cm, yet it’s still too short for users taller than 6ft. 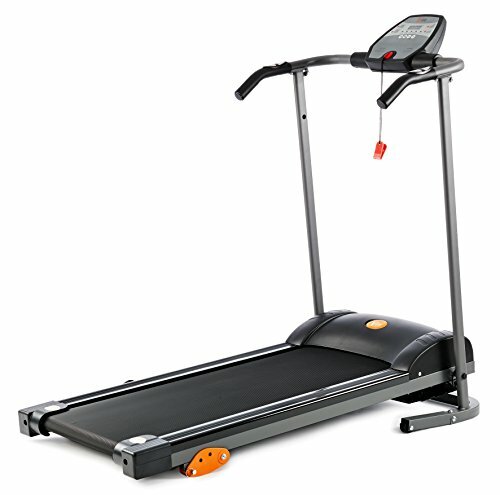 Just like other basic treadmills, it’s also not suitable for running as its motor cannot keep up with such activity. 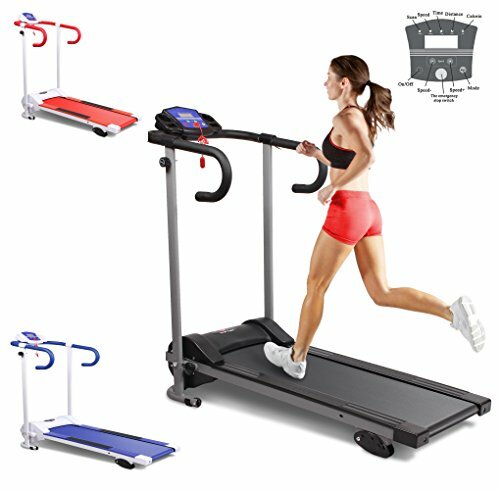 Hi-Performance Electric Treadmill Detailed Review? CLICK HERE. The Finether Folding Treadmill is another entry-level running machine that’s driven by a 600W motor. 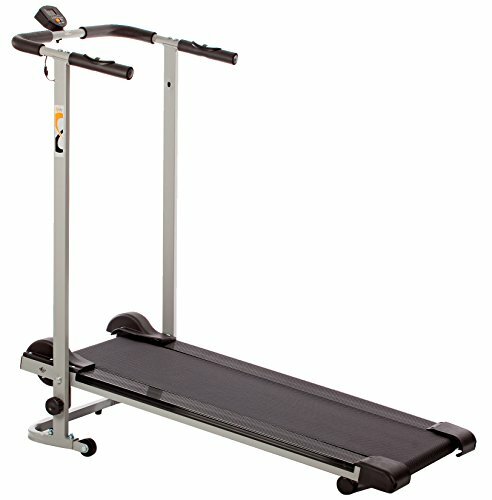 What’s unique about this basic treadmill is that it has a multi-ply running belt that provides comfort whenever you exercise. It has a wear-resistant layer, shock absorption layer, high elastic layer and a durable support layer. This treadmill also has three manually adjustable incline levels (1.5 degrees, 0.3 degrees to 2.1 degrees) and it has pulse sensors to keep track of your heart rate. On top of that, the Finether Folding Treadmill comes with a 3-year warranty, so you’re guaranteed it will last. Finether Folding Treadmill Detailed Review? CLICK HERE. This manual treadmill is offered at a slightly higher price, and I guess it’s because of its magnetic resistance levels. Although it’s a manual treadmill, the Confidence Fitness Magnetic Manual Treadmill has eight adjustable levels of magnetic resistance and a fixed gentle incline. When compared to the V-fit MTT1 Self-Powered Folding Treadmill, this treadmill has a slightly larger running surface that measures 102 x 32cm, yet it still can’t accommodate taller users, but it can hold a maximum weight of 100kg. 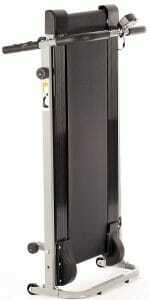 This entry-level motorised treadmill is also from V-fit, which means this product is also of high quality. It’s driven by a 1.25HP peak 500W D.C. motor with a top speed of 8.0 km/h. This treadmill is made of a sturdy tubular steel frame that’s coated with chip-resistant paint. It has an impressive running shock absorbing flexi-deck that measures 120 x 40cm. It also has integrated pulse sensors that are conveniently placed on the handlebars to easily pick up your heart rate. The V-Fit Start Folding Treadmill also has a 3-position manually adjustable incline so you can add variety to your workout session. V-Fit Start Folding Treadmill Detailed Review? CLICK HERE. With all the specifications laid out and after comparing to other models, the V-fit MTT1 Self-Powered Folding Treadmill is an excellent choice for those who are eyeing on an affordable treadmill that can work well even in limited spaces. Manual treadmills don’t only help conserve the environment, but they also serve as a great start for those who are trying to get fit and for those who want to lose weight but aren’t that confident about their fitness level yet.